Earlier this week I headed out for the second day of Happier @ Work training at a company in Toronto. 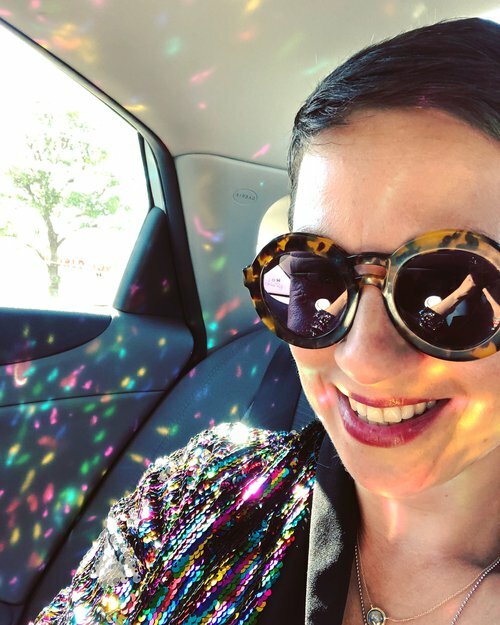 On the way from the hotel to the office, I noticed how the sunlight was reflecting off my jacket and making the interior of the car look like a disco. I couldn’t help but take a photo - an Uber disco, how does that not make you smile? As I finagled the phone to take the photo I ended up spilling some of the coffee I was holding all over my jeans. To be more accurate, I spilled half a tall Starbucks latte. It was not a small amount. Not my most elegant moment! “I’m so excited to see all of you this morning!” I told them. “And yes, I wore this super sparkly jacket to remind us all about the value of tiny little moments of joy and fun that we can intentionally sprinkle and find in our days." There were many “oh no’s” and a lot of “omg” from the audience – and a lot of smiles. And that’s life! It’s messy and unpredictable and filled with a lot of spills and a lot of sparkles. Sometimes it’s really difficult and challenges us to our very core. Sometimes there are oops and ugh moments. And sometimes it’s filled with moments that make our insides jump with joy. And our practice is to learn how to embrace it all – the good, the difficult, and the in-between. This is how I think about happiness. Not as a state of bliss you arrive at once you do certain things in certain order or achieve some milestones or get lucky. But a skill you practice, daily, hourly, moment by moment, by finding more joy in everyday moments and elevating them through your gratitude and attention, and by allowing yourself to feel the difficult feelings with self-compassion and without judgement. Spilling hot coffee all over myself before a presentation to 100 people sucked. There was nothing good about it. But in accepting that it’s what happened and then sharing my oops and my feelings about it with others, without self-judgement or recrimination, I got through it with a little more ease. And the sparkles on the jacket helped. Because sometimes a little tiny moment of joy is exactly the kind of lifeline we need to help us through a difficult moment. What makes the daughter of the Happier CEO happier? What chance will you take today?